When I was 13 I was finally diagnosed with Ehlers-Danlos syndrome (EDS), an inherited connective tissue disorder and reflex sympathetic dystrophy (RSD) which is a neurological condition. Having these rare conditions means everyday tasks cause severe pain and difficulties moving. At 14 I became a full-time wheelchair user, and life changed dramatically. I was stuck at home, in and out of hospital and I was severely lacking in confidence and self-esteem, didn’t like going out and if I did it was only with family. I attended a wheelchair tennis camp and met a lady with a dog in a purple jacket who explained that her dog was a Canine Partners assistance dog and that he helps her with everyday tasks. ‘Wow, I have to get one of those’, I said, so I decided to apply once I had my own place. Finally after waiting five years I got my wheelchair accessible flat, applied and was matched to Griffin. It was definitely love at first sight. When we got home together, that’s when life changed overnight. Waking up the next morning to see those big brown eyes and big nose in my face I knew he was ready to help me get out of bed. Gone were the days of having to ask for help; no more calling my sister to help me. Griffin’s all I need. Griffin has over 40 tasks which include opening and closing doors, loading and unloading the washing machine, picking up items I drop, getting my phone, and pressing crossing buttons. He brings my manual wheelchair to me when I need to get out of my power wheelchair; he takes off my shoes and jacket when we get in; opens the fridge and closes it; presses switches for me. This list goes on and on. Even if he hasn’t learnt to do a task he always tries. One night I was sitting on the sofa and I leant forward too much and I was about to hit the floor when Griffin jumped up from his bed, ran under me and stood leaning against me and pushed me up. Since Griffin came into my life I have achieved quite a lot like going out by myself and going to appointments on my own which I have never done before. For the first time I felt like an adult. My confidence and self-esteem have grown so much I now enjoy going out, doing new things and meeting new people. He loves showing off his skills to everyone especially when he gives my purse to the cashier and gets it back to give to me. You see his eyes light up and his tail never stops wagging. It’s usually followed by people in the queue saying ‘awww’ and ‘did you see what that dog just did – how amazing’. Life with Griffin is happier and so great – I couldn’t be without my boy. He’s my world. I love him to pieces and I’m so proud of him. 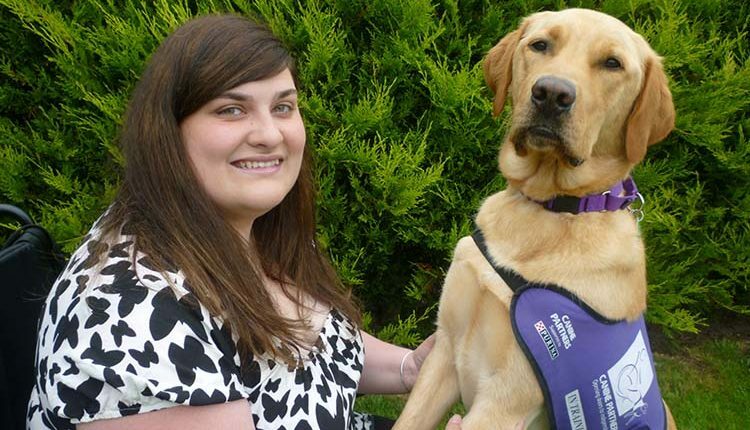 I can’t thank Canine Partners enough for transforming mine and my family’s life.